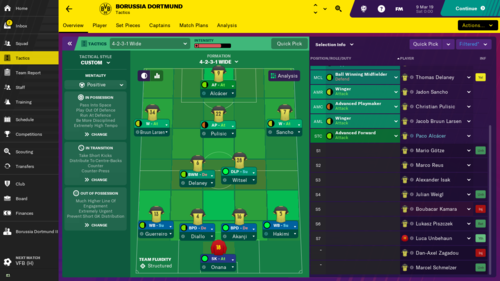 ...to the FM19 Borussia Dortmund thread! Ballspielverein Borussia 09 e.V. Dortmund, commonly known as Borussia Dortmund BVB, or simply Dortmund, is a German sports club based in Dortmund, North Rhine-Westphalia. 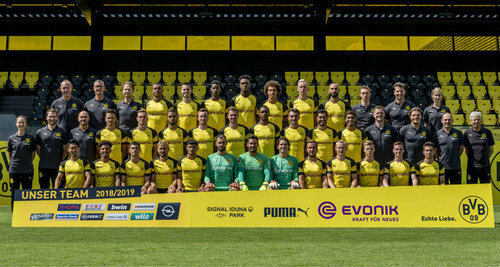 Founded in 1909 by eighteen football players from Dortmund, the football team is part of a large membership-based sports club with more than 145,000 members, making BVB the second largest sports club by membership in Germany. Dortmund plays in the Bundesliga, the top tier of the German football league system. 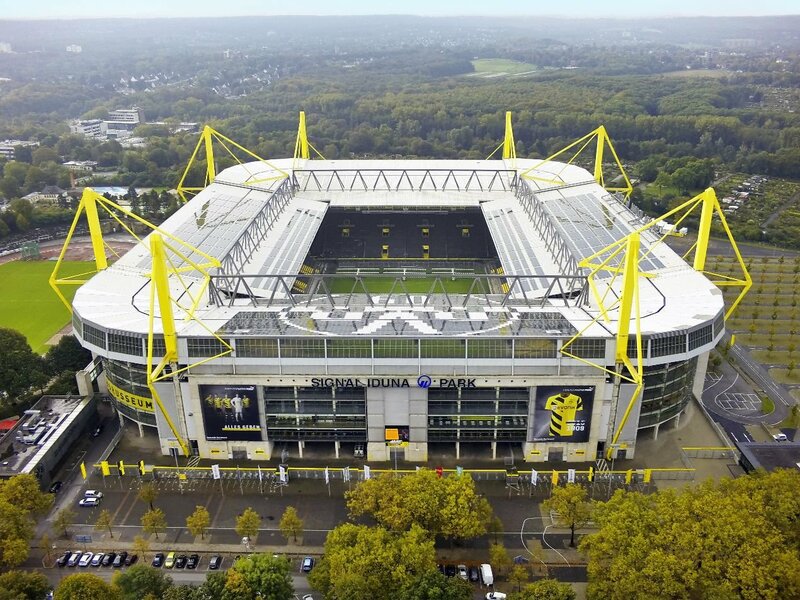 Since 1974, Dortmund have played their home games at Signul Iduna Park, named after its home region of Westphalia. The stadium is the largest in Germany and Dortmund has the highest average attendance of any association football club in the world. 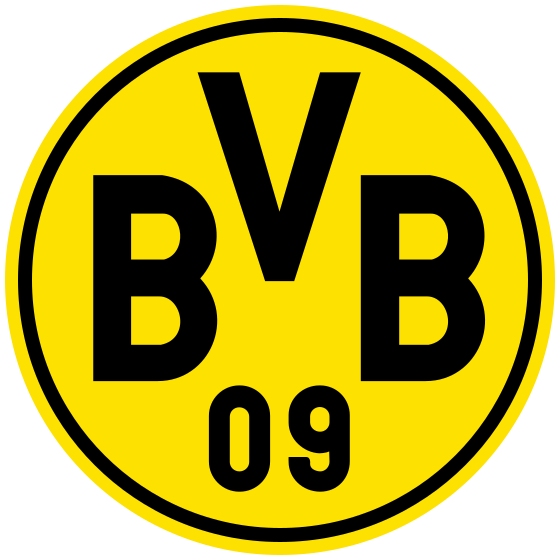 Borussia Dortmund's colours are black and yellow, giving the club its nickname die Schwarzgelben. Dortmund holds a long-standing rivalry with Ruhr neighbours Schalke 04, known as the Revierderby. 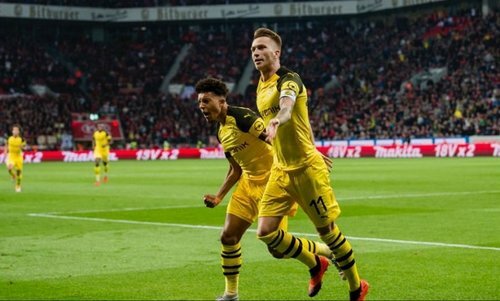 In terms of Deloitte's annual Football Money League, Dortmund is the second richest sports club in Germany and the 11th richest football team in the world. Signul Iduna Paek is a football stadium in Dortmund, North Rhine-Westphalia, Germany, which is the home of Bundesliga club Borussia Dortmund. The stadium is one of the most famous football grounds in Europe and is renowned for its atmosphere. It has a league capacity of 81,365 (standing and seated) and an international capacity of 65,829 (seated only). It is Germany's largest stadium, the seventh-largest in Europe, and the third-largest home to a top-flight European club after Camp Nou and the Santiago Bernabéu Stadium. It holds the European record for average fan attendance, set in the 2011–2012 season with almost 1.37 million spectators over 17 games at an average of 80,588 per game. The 24,454 capacity Südtribüne (South Bank) stand is the largest terrace for standing spectators in European football. Famous for the intense atmosphere it breeds, the south terrace has been nicknamed the "Yellow Wall”. Dortmund has one of the most technologically advanced facilities in the world. They were the first club in the world to use the Footbonaut, a robotic training device that fires balls at different speeds and angles for players to control and then pass into a marked area. Now, there are a handful of German clubs who use it, but Dortmund's surprising league title was partially credited to the Footbonaut, as was Mario Gotze's goal in the 2014 World Cup final. The facilties have helped create several talented youngsters coming through the Dortmund academy, notable players from the 21st century are Mario Gotze, Marco Reus, Christian Pulisic, Antonio Rudiger, Marcel Schmelzer, Jacob Bruun Larsen & Nuri Sahin. The aim is to create a close-knit community, one that matches the club’s bond with the city it serves. The very best teenagers are invited to stay at Dortmund’s boarding school, with 22 boys aged between 15 and 19 housed in rooms at the training ground. All 200 players at the club, starting with boys aged eight, practise at the training ground in the quiet suburb of Brackel, where low-rise buildings are set alongside 18,000 square metres of manicured football pitches. The set-up is designed for the young players to see the first team up close, allowing them literally to view their path to the top. But the facilities are also deliberately sparse and unfussy — youngsters and veterans are encouraged to mingle on a level playing field. 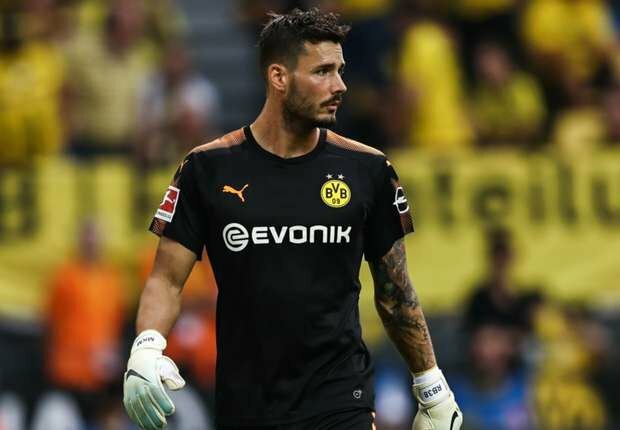 Roman Burki’s your number one, Marvin Hitz is a great number 2 to have and if needed can be called upon without any doubt that your team will collapse, as shown in the 3-2 against Bayern Munich this season. Burki is 27 now therefore has a good 5 years in his no problem, he has been in exceptional form this season and shown just why his stats are high for a sweeper keeper, allowing your team to dominate the ball high up the pitch. There is a good goalkeeper in the under 19s called Luca Unbehaun who has great potential. You might want to invest in a goalkeeper around the age of 18-21 who could push on to be a first team starter in a few years or at least give stiff competition to Burki. Defensively, you’re in a very strong position. 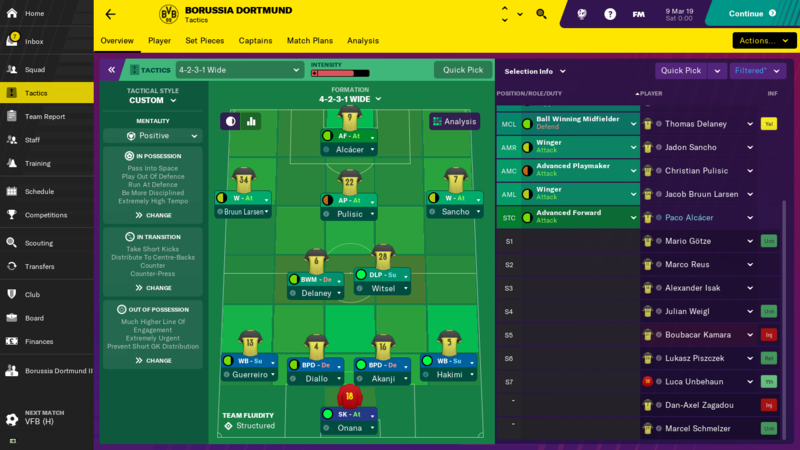 Starting at right back, there’s are two strong candidates, the ever consistent as Lukas Piszczek & Hakimi Achraf, the young loanee from Real Madrid. Both are equal in terms of current ability, however Piszczek is due to retire in 2 years’ time and his physical stats will deteriorate over this period. Jeremy Toljan is currently at the club, he is a good squad player to have with a little increase in potential to reach the ability of Piszczek, however there is a lot of interest in him, the game time would be very beneficial to see if he can reach his potential. Felix Passlack 21, is on loan at Norwich and possesses great potential too, therefore after the 2 years is most likely to become your first choice right back unless a big fee is paid for Achraf. 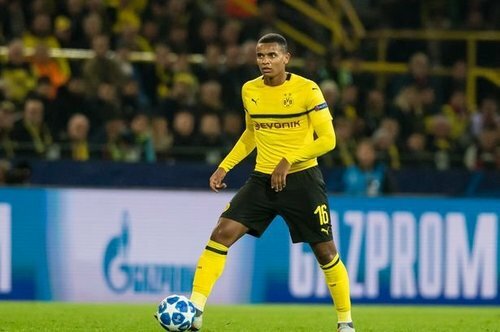 You have two good central defender who can become class acts for the club, these are Manuel Akanji & Abdou Diallo. Diallo arrived for 28m euros from Mainz in the summer and Akanji arrived last January for 18m euros from FC Basel. Both are your modern-day centre backs, great on ball with strong physical stats and plenty of pace. Dan-Axel Zagadou is another player in the same mould, however is not currently as good as Diallo or Akanji, but over the next few years he will provide good competition. Omer Toprak is a an experienced centre who is first choice for Turkey, he is strong positionally and can play in a cover role, in case you are getting punished by the long ball. The standout player ind defence is Raphael Guerreiro at left back, he has some great attributes to make the left flank a great attacking threat. Behind him, there’s the ageing Marcel Schmelzer who is on a rotation contract, therefore playing him in the cup or lower oppositon league games would be enough to keep him happy. In real life Achraf Hakimi has been playing in the full back roll on occasions, there is a chance to train him up to play in this position, with him on a 2 year loan, there is enough time for this to happen. In midfield you have great opposition and versatility, Axel Witsel, Julian Weigl, Thomas Delaney, Mahmoud Dahoud & Sebastian Rode. The dilemma is that Julian Weigl is wanted by your arch rivals Bayern Munich, therefore to drive away this interest would require a new lucrative contract and meaning he will want to become a key member of your squad. However, Weigl and Witsel are very similar to one another and playing them in the same team would be hard. Mahmoud Dahoud is a great option to have against the weaker sides, allowing your midfield to be more attack minded, helping to break down the opposition. Sergio Gomez is a very talented youngster who could also benefit from game time or allowing him to go on loan once he is 18. I’d suggest that Sebastien Rode provides cover for the consistent Delaney, who can play as a ‘Ball Winning Midfielder’ or ‘Box-to-Box Midfielder’. So far this season Dortmund have operated a midfield 2 of Axel Witsel and Thomas Delaney when both have been fit to play, I think these as a partnership have great balance. Attackers, where do I start, they are young exciting and clinical, scoring 46 goals in 17 games this season, an average of 2.7 per game. I will start with the resurgence of Marco Reus, he has stayed fit so far this season and long may it continue, he is in fine form and has contributed more goals and assists than the whole of last season. Next up you have the two young wide men of Jadon Sancho & Jacob Bruun Larsen, both have contributed goals and assists for Dortmund this season, both earning call ups for their national sides of late too, they have great potential but can also operate right away. In the number 10 role we have another resurgence in Mario Gotze, after starring in the 2 league winning campaigns and scoring in the 2014 World Cup Final, he moved onto Bayern Munich, it did not work out successfully and he returned to Dortmund. He is starting to show the same form, that he was showing under Klopp’s Dortmund and he has great competition from the rising world talent of Christian Pulisic, a quick-thinking number 10 that can also play on the right wing. Shinji Kagawa is another player that was key to the title winning sides, he has returned but has struggled to regain the form he previously shown during his last spell at the club. Manuel Pherai is a decent prospect to develop from the youth team, allowing him loan time when possible would be recommended. The No.9 role is strong, you have Paco Alcacer on loan with the option to buy for 23m euros, he has shown his ability in real life this season, scoring 8 Bundesliga goals in 236 minutes. Another viable option is Maximilian Phillip who is an unselfish forward who would press well and link up with your other attackers. Then in the youth team you have Alexander Isak, signed from AIK at the age of 16 for 8.5m euros, he possesses great potential. If Alcacer shows good form it could well be worth taking up that option to buy otherwise there is no real need to invest in good attackers for your first team for a good number of years. You missed Toijan in defense . Diallo also arrived from Mainz not Stuttgart. I also don't see the point in opening a dedicated Dortmund Thread when there is an overall Bundesliga one. I'm not giving out BTW posters can post whatever they want. As I said I'm not giving out. It's a great overview of their team and of the club. Best of luck with them. I'm managing them myself so if you need any tips let me know. 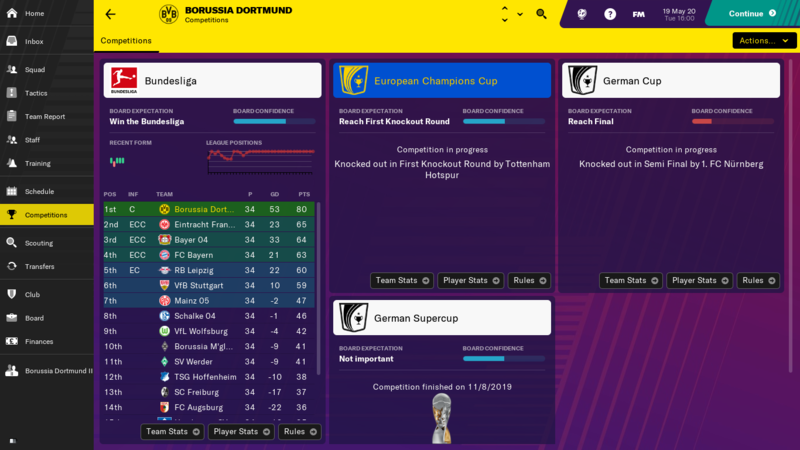 Had a great save with Dortmund last season, think I'll give them a go once my Roma save sees me sacked. Be a relief to be able to use Reus from the start. Yeah nice start to the thread mate! Got me considering a Dortmund save now. 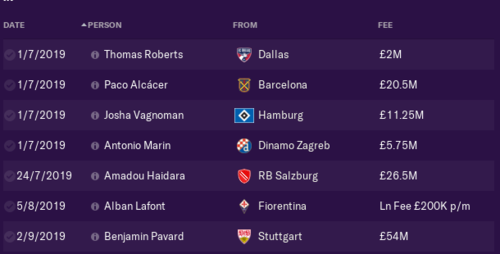 Arp was great on the last FM, I never stuck with Hamburg long enough to fully develop him but he was still pretty great. - Although I decide who we buy, sell, and renew, Michael Zor negotiates all transfers and contracts (I'll negotiate sales though) - a setup that worked well for me on FM18 with Real Sociedad with a far inferior DoF. - Letting Zorc handle my scouting meetings, just to speed things up. - Loan players must have one year left on their contract beyond the length of the loan, as this is actually the rules in German football, just something SI haven't implemented. I've switched off first window transfer budgets as I like to play a realistic first season, and I've brought in "favoured personnel" Stéphane Chapuisat as my Chief Scout. This is my planned First XI. Götze and Reus' positions inspired by what I've read about how they play under Favre this season, and the playing style (only modification is the crossing) is chosen because I like the look of how the game suggests it'll play, and we have a bunch of good dribblers. 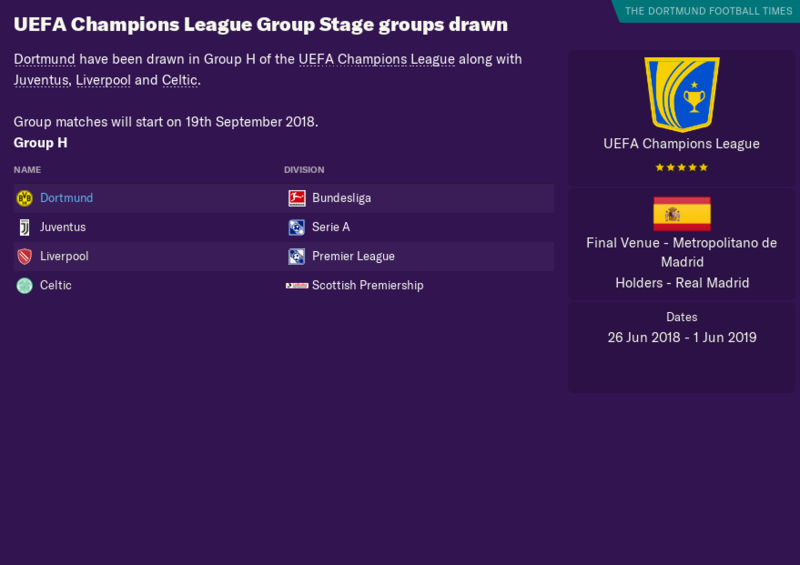 Groups like this must be what they had in mind when they created the group stage...four former champions! 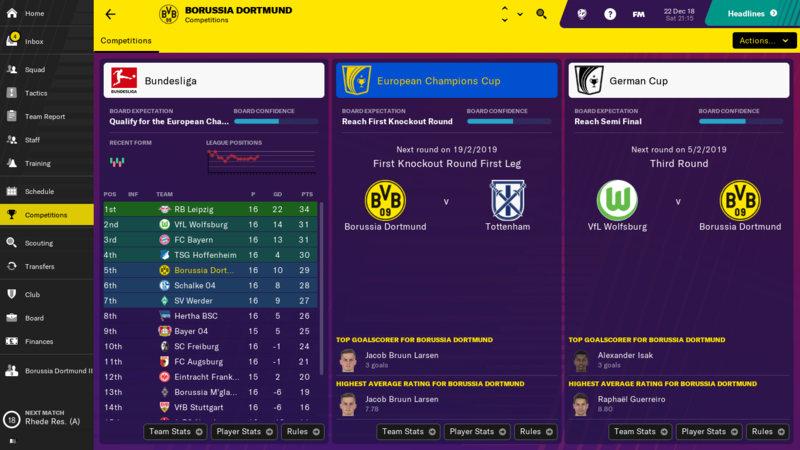 Speaking of champions, I decided to sack the AM and replace him with Steffen Freund, who is weaker on most coaching aspects but has a better personality and a CL winners medal with Dortmund. 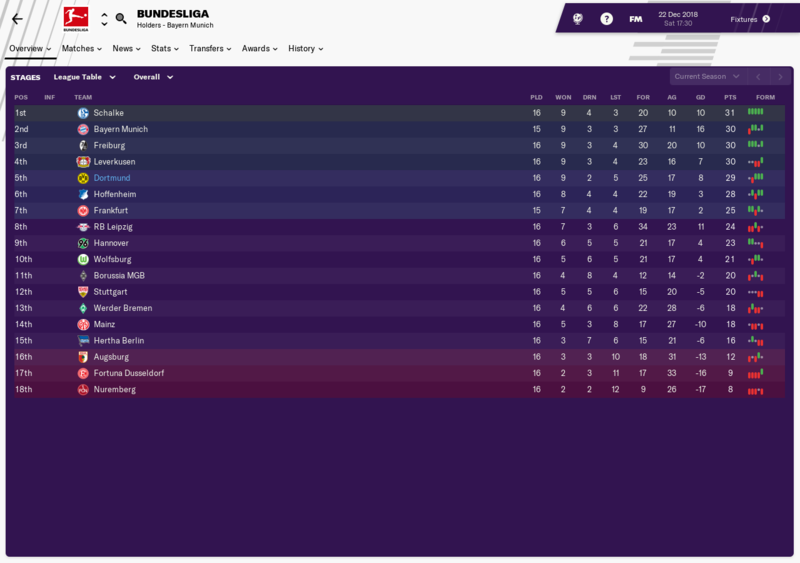 I am looking for a strong second half of the season, I am still within reach of the top but inconsistency is costing me, i can't find the perfect tactic as of yet. But still in 3 competitions and board confidence is at 56% so all sets up for an exciting finish to the season. 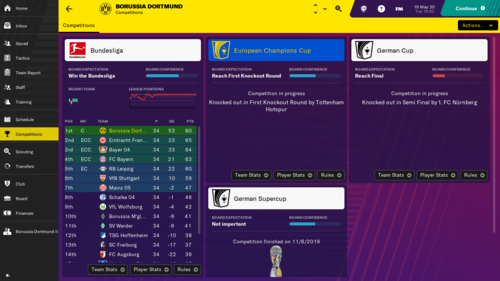 Very similar to Zlatanera with my UCL Group, the only difference was me getting the young exciting Club Brugge side, who are in Dortmund's real life UCL Group. 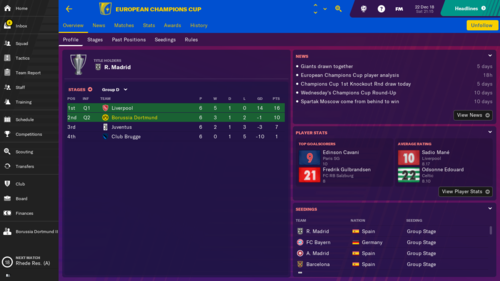 I was happy to with the 2nd place finish, Liverpool have a great side for FM, full of goals, pace and power, then Juventus a complete side with the addition of Ronaldo. The 4-0 home win against Juventus was the highlight by far, we was leading 2-1 against Liverpool at home until a 92nd min equaliser by Salah, the 2 Club Brugge games were dominated, however the scoreline not reflecting this. 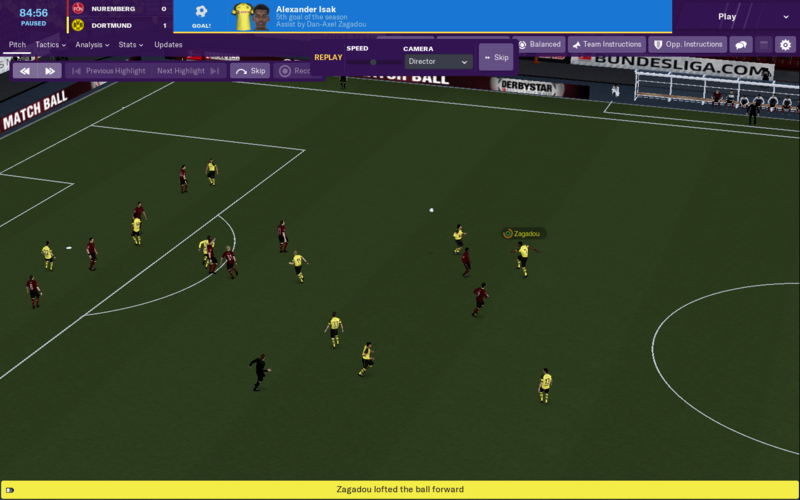 The 7-2 defeat to LIverpool was very poor, we were 2-1 down at half time but Andrew Robertson had just been sent off, i then quickly equalised and then my team got done on a long ball counter and they just folded! My position of 5th place is due to my really poor away form, at home i have picked up 22 points from a possible 24, however away i have only picked up 7 points! i can't seem to play well at all or when i do i just don't take my chances but the opposition does, i've tried 4-4-1-1 and 4-2-3-1 but i may consider playing a "Fluid Counter Attack" rather than a "Gegenpress". ROLL ON THE 2ND HALF! 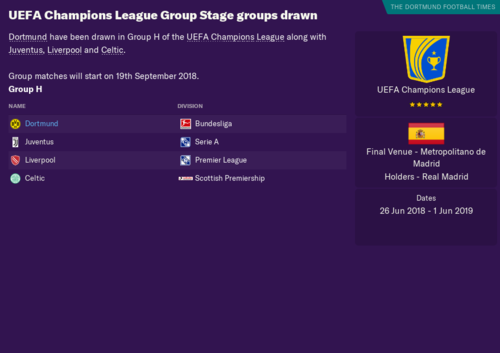 I've got Inter in the CL knockouts, who are probably the weakest of the 1st place finishers - the only "upset" in the groups was Juventus not making it out of mine. Icardi will probably have a field day getting in behind my defence though - was contemplating selling Diallo (10 Concentration isn't great) but then Pavard signed a new Stuttgart contract and I'm not sure who else I'd get instead of him tbh. Three games ago we were 9th, and I was getting questions about my job. We were only 3 points behind Freiburg though, and there was only 7 points between 1st and 10th. In the Pokal we have the Kleines Revier Derby against Bochum, so should make the QFs without much trouble. I've had Burki taking all my free kicks, but I decided to give Reus a chance on them after he didn't score any this half-season, so hopefully we score a couple of them to give us a leg up. I do find it appears to be impossible to get many through ball assists, which means Götze and Kagawa aren't doing well in the ratings, sadly, but other than that optimistic for the rest of the season and the save. I play a 4-2-3-1 gegenpress which works wonders. @lblanc I've barely played Phillip, and when he has its been as striker (that may change - he's one of the few who pipes down with his complaints when you speak to him, so he's going to be my cover for the front 4), plus I like Kagawa from his United days. Were you on the beta ME with your save? Sancho's first 3 games with my 4231 went 7.7, 8.5, 8.2 but then I rested him for a couple of games and he's not been the same since. In terms of attributes and personality he's improving though, so I'm hoping he'll work his way back into form. I've been playing him as W-At in the AMR position. Yeah started my save on the beta. I've found Phillip too to be happy once you talk to him. I've played him in striker position as well but he mostly played in am support role he done well enough scored some important goals for me. @lblanc yeah just asking because I think they made pressing slightly less effective when the full game came out, and I don't think ME changes are save-compatible so that's what you'd be playing on. 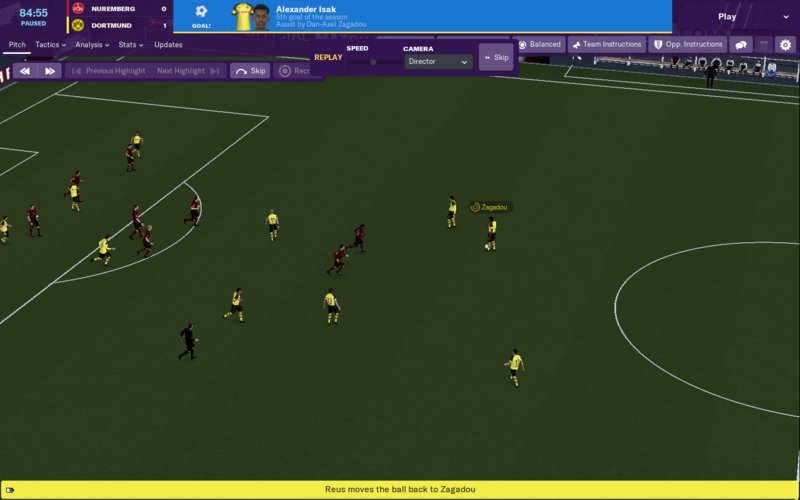 I'm still playing quite a high-pressing game though, just found with so many young technical players it makes more sense to play on the front foot. @zlatanera Haha the groups were very similar! Even the league was similar, what do you guys @zlatanera & @lblanc think of Burki? He is not playing great for myself at all, considering a January sale. @jlgray.94 I scored and conceded 1 more than you haha. Are you on touch, or is that just an interesting skin? I don't like him, but I can't find anyone else I'd rather replace him with. In my current tactic I just need a normal Defend duty GK but I have two SKs at the club, but there's nobody who's a significant upgrade available, and there's always the chance that I'll end up changing. However, if I can get Alcacer permanently and hold onto most of my talented attackers and defenders, the only places I'll be looking to upgrade are RB and GK so could see me splashing £100m on someone. But for now I'm trying not to break our transfer record, rather buy young players cheaply and develop them. There's nothing wrong with having first transfer windows active, I just find when I don't know the squad very well it makes more sense to switch it off, gives you one less thing to get sorted out. 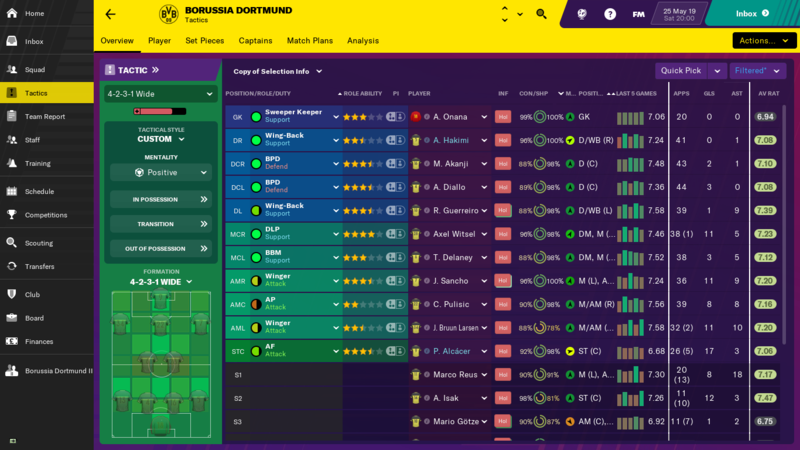 So when I do my Manchester United save, for example, I'll probably buy and sell 10 players in the first week, but I didn't know much about the current Dortmund squad. So far I've only transferred six players - loaned out Dzenis Burnic, and loaned out Marius Wolf to Leverkusen with a £21m option. 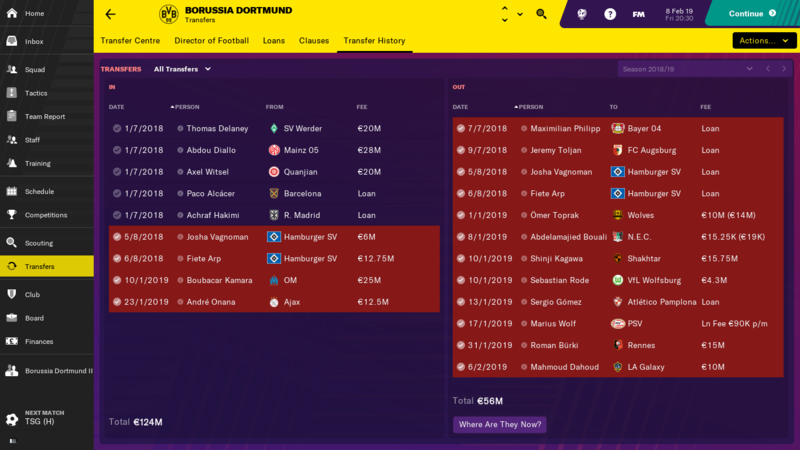 Toprak kick off about going to China - argued him down to only getting a £1k wage rise then noticed he had a long contract anyway, told him to go shove it then packed him off to Shanghai SIPG for £15m as I noticed Toljan can fill in if needs be. 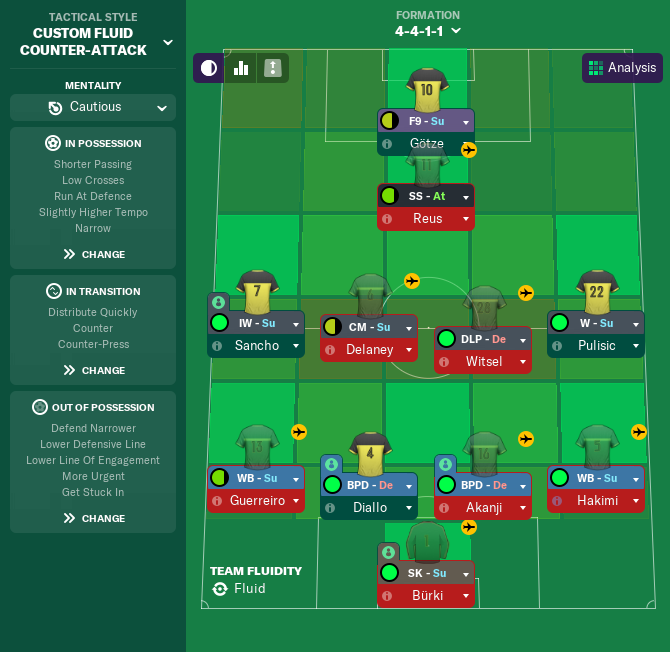 Then the game had recommended MLS so I've signed three young Americans to bring them to a civilised country where they're relatively safe from violence - Thomas Roberts joins from Dallas in summer, Auston Trusty (Philadelphia, £4.4m) and Tyler Adams (NYRB, £5.25m) have been brought in then loaned out to Brøndby and Darmstadt, respectively. 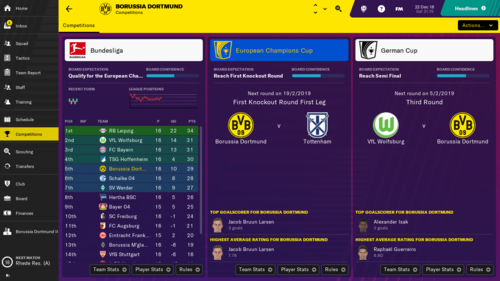 My squad is currently a bit thin, but i did go out of the German Cup 1-0 to Wolfsburg (Away), however my league form is looking good (7 Wins 2 Draws in Last 9) I beat Spurs 3-1 at Home in UCL Last 16 1st Leg, so hoping i can manage a positive result in the 2nd Leg. In regards to your transfers the signings of the American's seems to be the way forward, you have a few rising stars such as Haji Wright & Weston McKennie at Schalke, Pulisic at us and Alphonso Davies (Canadian) but coming from the MLS to Bayern, so your signings look promising! I have gone for Onana for the simple fact he was available on a foreign clause of 12.5m, he's not great at anything but also not weak at anyhting, hopefully with game time can deelop his stats to all around the 15 mark. I was happy to get 15m for Burki as he was appalling! Boubacar Kamara was an interesting one, i like Diallo and Akanji as CB partnership, however with Toprak gone it left me with only 3 CB choices, i originally went for De Ligt as he had a foreign buy out clause of 24.5m, i had a concern with that though because he would obviously want to start, so i went with Kamara and he looks a top prospect and was happy to be a rotation player. 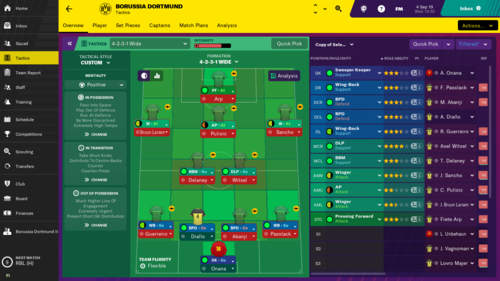 All in all happy with my transfer activity (6m net profit) and the team is starting to play really well, @lblancmentioned Sancho, he's starting to perform very well, i play him as a Winger Attack on the Right Wing too like @zlatanera and hes now in yellow for playing this role, hoping it can become natural by the end of the season. That is the current Tactic & Line Up i have been utilising and its been working for the 2nd half of the season. Leipzig did score in the 95th min to win 1-0 themselves! 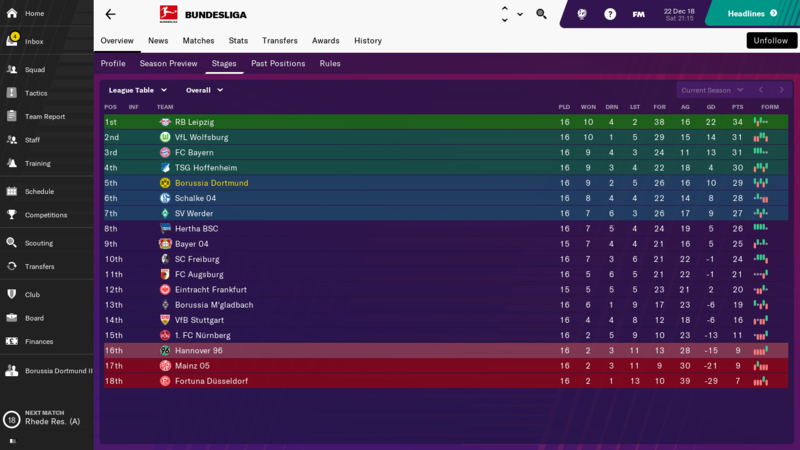 League - I thought i blown my chances when i lost at home to Schalke, thanks to a 92nd min goal from a indirect-fk, my goal difference was significantly lower and i was 2 points behind with 4 games to go, Leipzig were on a fantastic run and had also just made the cup final. However what a finish to the season, they truly showed their attacking skills to seal the league on goal difference! 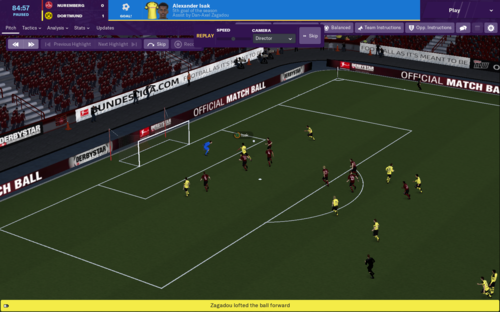 The 1-1 result with Werder was disappointing Reus missed a lot of chances and i had been leading 1-0, but the main game Gladbach, i was having the chances, Alcacer first 20 mins missed 2 one on ones, 65 mins on the clock, i bring on Isak for Alcacer and does that man deliver! UCL - Unfortunate defeat to Spurs, but this team isn't ready to win the UCL yet & i am realistic enough to say that i only won the league as it was a very low points total, i would expect to have to get around 80 points next season. German Cup - Wolfsburg were the better team and took 1 of their chances, sadly my finishing wasn't on point. But the lack of games helped have a good 2nd half of the season. Won the German Cup against Hoffenheim. Red Bull stormed the league, no one got near them. Hoping to do better on that front. 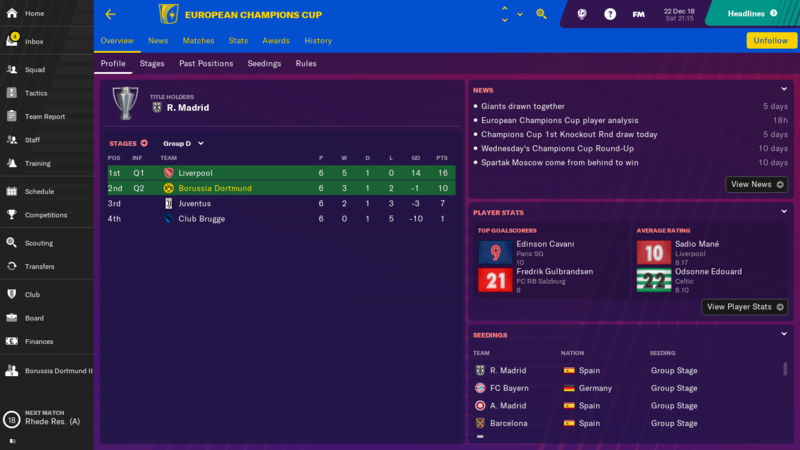 Got knocked out in group stage Champions league then shortly followed by the Europa Cup to Chelsea. Made Alcacer a permenant signing. Forsberg was a brilliant signing for me. Think I'll be selling a lot of underperforming players such as Gotze. Exciting team to manage on this year's version. In terms of Burki,, he done well for me, I brought in Jasper Cilessen from Barca for 10m to be my number 1 though. I played him mostly in the cup games but also Champions League which I got to the final. Sold him start of the second season to Spurs for 28m brought in Nick Pope for 3m as a replacement. @Daws88 Yeah i must say i don't think "Advanced Playmaker - Support" players are very effective on this game at all but congrats on the , I think the Leipzig save would be the easiest save to beat your Media Prediction (11th) they always seem to be near the top and have to top quality players in Upamecano, Werner, Bruma, Forsberg and Saracchi etc. @lblanc Thank You! Oh you made some good profit there, i am tempted to go and make a big signing this summer for a goalkeeper, Onana is not much better and if i can make quick profit on him i'll be happy, i have a transfer budget of 128m Euros and 400k Spare in wage budget. From what I've read the issue with central playmakers is an issue with the ME - you don't get enough movement ahead of them for some reason, so the likes of Götze, who isn't an especially good set piece taker, are always going to get low ratings as they're generally playing "the pass before the pass" to someone on the flank to cross it in / square it. I've moved to make Alcácer permanent as well. De Ligt isn't fast enough for my liking, plus had signed a new contract so wasnt interested, I'm using Zagadou as my 3rd CB (he complains a lot but he seems to play well regardless - actually trying to earn his place in the team when given the chance) and retraining Delaney to be my emergency cover there. I have Arp away on loan for 2 years, however he can be recalled and will most likely recall him and Vagnoman, Alcacer contributed 17 goals but I prefer my striker to be getting 25+ so he won’t be getting purchased. Ah I didn't realise its a bug with the ME. He got 8 assists all season, and Phillip who I rotated with didn't do much better. I signed Milik who was transfer listed for 20m and Zorc signed the winger from Kyiv, tsygankov. Might sell Dahoud as he constantly moans, as does Weigl, but both are younger than Witsel and Delaney. Onana was signed in January, doing a steady job for me. Agree at RBL, they are a very talented team if they can keep all there players. Hudson-Odoi - I wanted to link up Reiss Nelson and Jadon Sancho, having the two London young kids back together, however Arsenal wouldn't sell Nelson or loan him out, so then i had a look at the loan listed and found Hudson-Odoi, who is a great prospect, shown his ability in pre-season for Chelsea. Layvin Kurzawa - Signed on loan for a fee of around 3m, there was a chance to just purchase him for 8.25m, however he is just signed primarily to offer cover for Guerriero after Schmelzer departed. Marco Reus - He had a fairly good season last season, he wasn't always starting but got 8 goals and 18 assists. I did though have to sell him, he is 30 and on a very high wage, 70 million euros came in from Bayern and i had to snap there hands off. Maximilian Phillip - Over the moon to have got 23m rising to 29m, he did not have the best of seasons on loan at Leverkusen last season, so i wasn't expecting much but Napoli were feeling very generous. Mario Gotze/Marius Wolf - Both of these have gone on loan, i would have preferred to sell both, especially as Gotze contract is due to expire at the end of the season, but no teams were prepared to pay both of these players wages. 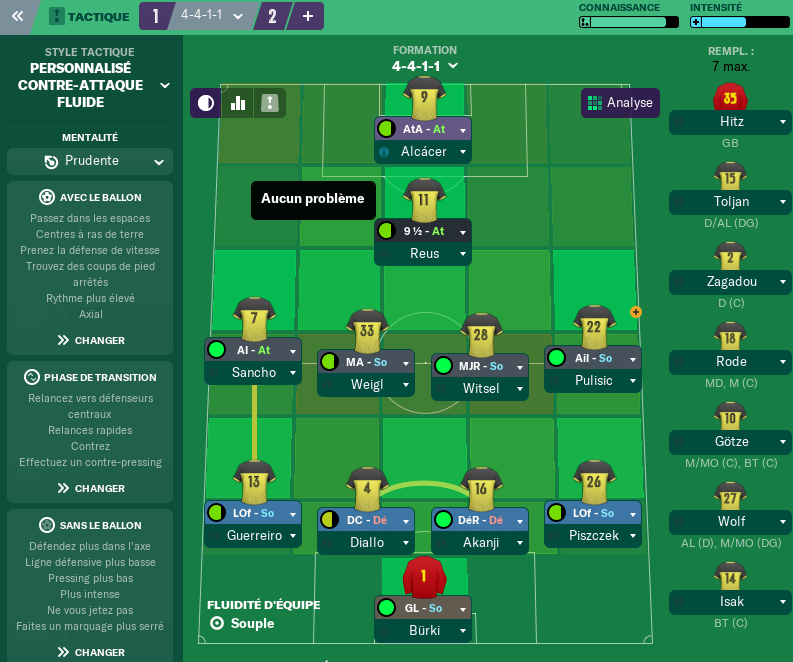 I have decided to play quite an attacking line up and then during games, when I am looking to be more solid I change my mentality to balanced and change my central midfielders to the following; Thomas Delaney (BWM-D) & Axel Witsel (DLP-D). What a start this man has made to the season! He looks a really top player as a pressing forward, he has notched up 10 goals (3 Hat Tricks) in 3 starts and 1 sub appearance. League - Back to back league titles, secured with 3 games to go hitting a solid 80 points. The first 15 games were a struggle and then my team kicked into gear, winning 14 and drawing 2 of the next 16 matches, that pretty much secured the league opening up a double figure point lead. I was much better this season away from home and as usual making Signal Iduna Park a fortress, I picked up 46 points at home and 34 away fro home. UCL - Very similar to last season, this time i won the 1st leg at home 2-0 (3-1 Last season) then i lost 3-0 away to 2 late goals coming in 86th & 91st min, lesson learnt now, i will play on the counter with 2 defensive midfielders if i am leading from the first leg in future. I feel this team with a couple of additions can get into the very latter stages of the champions league next season. 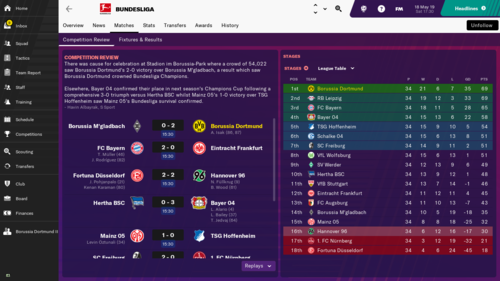 German Cup - Very disappointed to lose away to Nuremburg (Divison 2) in the semi final, Werder Bremen had already beat Bayern in the semi's, it was ours to lose but fair play to Nuremburg, they were the better team and they did go on to beat Werder 1-0 in the final. Just finished my 1st season, we lost out to CL football on the last day, with Schalke of all people overtaking us on goal difference. At the end of February we had won 7 games on the bounce and were only 2 points behind Bayern...we only won three games after that. 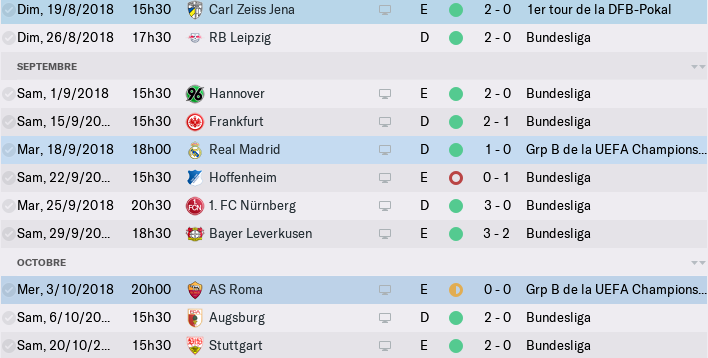 Injuries played a part - haven't had two fit centre backs since Bayern hammered us 5-0 in the first game of April, and Paco Alcácer, after getting injured almost immediately after I arranged for him to join permanently in summer, only scored once in 10 starts, whilst also preventing Alexander Isak (who scored or assisted in 6/7 games during Paco's injury) from getting a game. We also went through a phase of conceding off corners, which is weird. I really don't know what I'm doing tactically going forward, and therefore also don't know who I might try to sign - if I take much stock off the game's CCCs stats then my 4231 is terrible, but I don't know how much I should care about them to be honest. A right back is definitely required as Madrid allegedly want to give Achraf Hakimi game time and Passlack is weak in all the wrong areas), and Reus had his leg broken in a tackle in our 2nd last game against Fortuna Dusseldorf, so I have to hope it doesn't ruin him. how’s some of the youngsters improving like gomez and bruznic? Sold Guerrero, Rode, Toprak, Toljan, Schmelzer, Kagawa and Weigl and brought in Kurzawa, Vicente Iborra, Mile Jedinak, Andre-Pierre Gignac and made Alcacer permanent. On FM Touch, I should add. 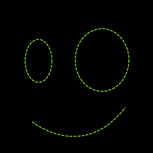 Hi everybody, I'm a newbie on the forum even if I read it since months now. Oh and I'm french, btw! Anyway, I started a career on FM19 with Dortmund, try to replicate how they're playing under Favre but it's a bit complicated. It feels like they're playing a possession patient building football but with a counter attack mentality how they project themselves very fast when the ball is won again. But the thing is, I don't really like how my team's playing. It's not as fluid as I would it be. But, let the time do his thing right. My main issue is I don't know how to make Reus perform in this position. Playing as a shadow striker feels like the perfect deal but in reality it doesn't work at all. He's loosing a lot of balls, all of his assists are on set pieces and his only goal was a penalty (he already missed one in the early games of the season). I'm a bit deseperate to make him perform in this team. 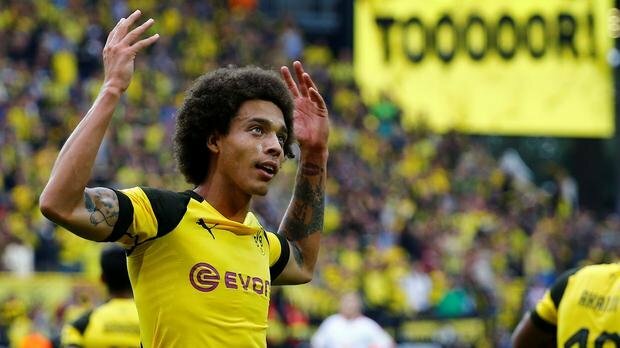 I feel like he could be the player that make things right for the rest of the team and now, thanks to Jadon Sancho and Alex Witsel for being my saviors because other players aren't really good. @Delial Shadow Striker is called 9&1/2 in French? That's pretty cool. Have you tried just playing him as a AM on Attack duty? Allow his intelligence as a player to shine through without so many instructions? 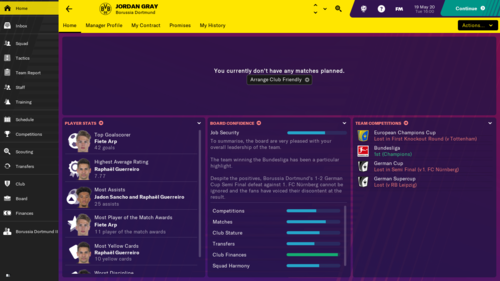 I also tried a similar setup to you but couldn't hack it, I've really struggled to get the best out of anyone in the AM position on FM19. @zlatanera Yes in french we're like it's something between a 10 and a 9... It's pretty cool. While a Trequartista is called something like "Support forward". Frustrating haha. Anyway, no I didn't really tried playing him as an AM. Maybe I will ! It will allow my other AMC to play the same position and role without doing any tweaks that could disturb the whole team. It's absurd because my team is doing good if we're only looking at the results. But it's ugly as hell. I feel like it's a bit complicated to play beautiful football in FM18/19 without playing possession of tiki taka football. 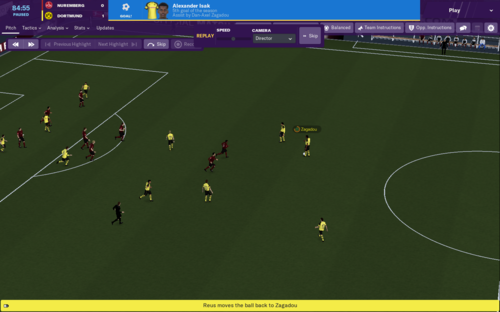 Back in FM16, I had emulate my Olympique de Marseille carreer with a tactic like Atletico's Simeone and it was beautiful. I know there’s like 2 ways of thinking about partnership between SS and the striker. Some says that SS needs the space created by advanced forward and other that a SS always has to play with a striker that comes deep. I will try with Gotze as a False 9, thank you! IRL, Reus do act like a SS but when Alcacer is playing, he really acts as a Poacher IMO. 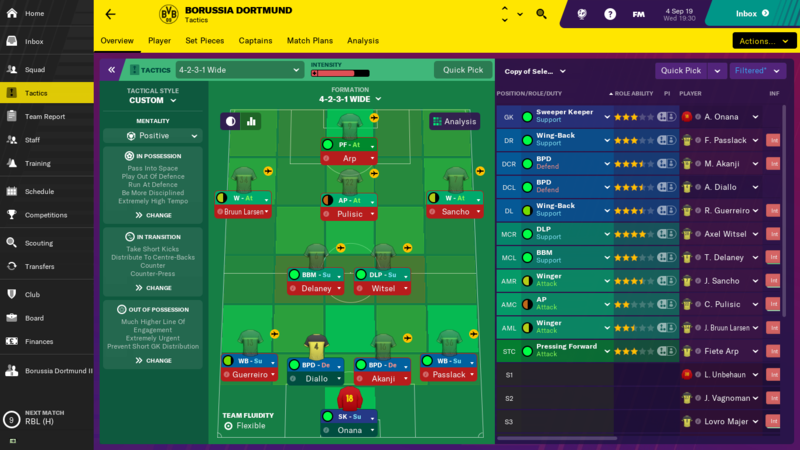 In my initial tactic I had Reus as SS and Götze as False 9 and it was about the only part of my fluid counter-attack system that worked, so good luck with it! Lafont is my official Top Target, Zorc has scouted him and Reus has spoken about him in the press, but negotiations would always fall down at a final asking price of around £38m (this was about £26m with add-ons taking it up to £38m). 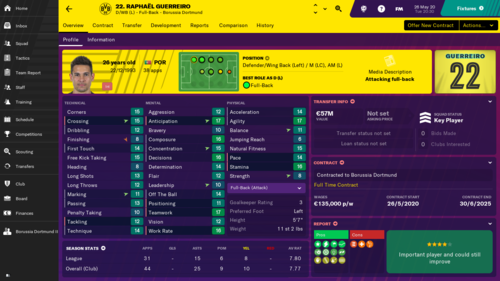 Juventus making a loan+mandatoryfee bid for Guerreiro gave me the idea to try it, and I've perhaps overbid slightly (went from £2.5m loan + £30m to loan + £40m in one negotiation), this is still £5m difference from what Zorc had set his upper limit as. The difference is also more than Lafont's value though! Still, he's one of the best younger keepers on the game and the others I found who were interested had flaws such as injury proneness (Pickford), a weak stat (Onana's concentration) or poor ability to adapt to a new country (Pickford again). This might still turn out to be a good deal, but it slightly frustrates me that after having broke our transfer record by a couple of million £ (Amadou Haidara from RB Salzburg for £26.5m > André Schürrle's £24.5m) I'm now committing to blow it out of the water by another £15m. Still, the method of the transfer is fun - makes me feel like Beppe Marotta! 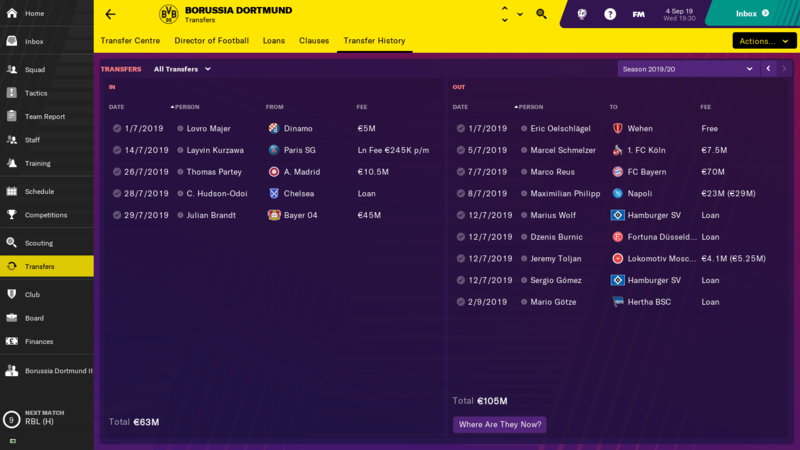 Finally got to the close of the 2019 summer transfer window after a lot of deliberation on a lot of bids and potential signings, as well as a new tactical approach for the season after the implosion at the end of 2018/19. We technically broke our transfer record three times - first for Haidara, then Lafont's mandatory £40m fee (which the game doesn't count yet), then finally for Pavard on deadline day, who was simply too good to let go. Roberts is a young American who will play for the u19s, Vagnoman will be my rotational right/left back, Marin will mostly play for the u19s but be in the first team squad to keep him happy, and Pavard will play at right back. 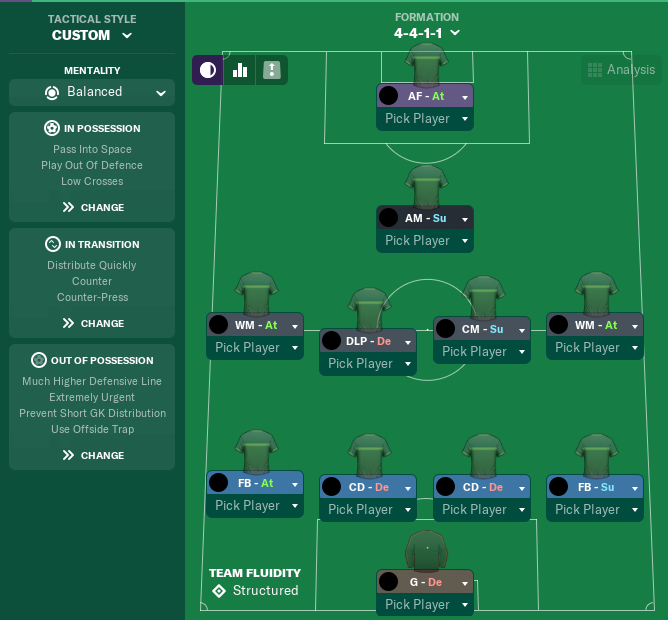 I had planned to utilise Felix Passlack, and he played three games averaging a 7.3, but Bremen are offering 1st team football I can't provide. Nobody we didn't want rid of. Kagawa is out on loan to Atalanta - they agreed a mandatory fee but he turned them down so its optional, simialar situation with Marius Wolf to Huddersfield, and nobody bid for Sebastian Rode so he had his contract mutually terminated and is now at Rostov. This tactic is based off this brilliant thread, which has been a go-to for me since it was written. 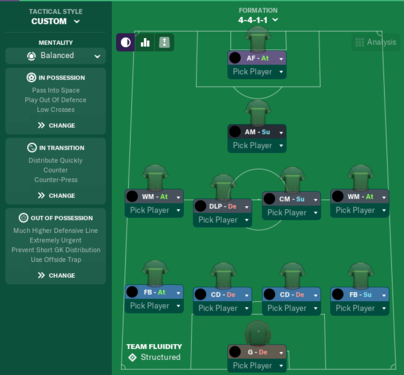 If figured 4411 will allow me to take better advantage of my players' brilliant dribbling by positioning the wide men further back so they can run at defenders. There are personalised instructions for the wide players and centre backs as all my centre backs are BPD, and the wide players are either W-At or IW-At. One of the perks of Europa League football is a 7,383 mile round trip to Kazakhstan! [/sarcasm]. 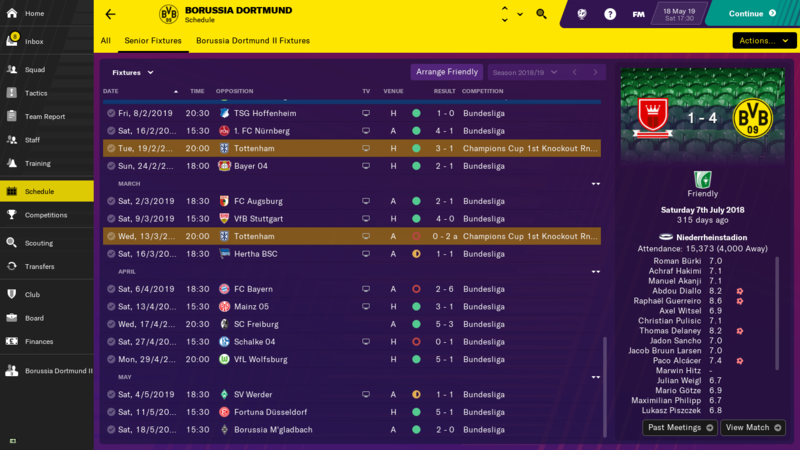 Obviously the fatigue that comes with the travel is not ideal, but its more interesting than playing Liverpool, and Porto every year which seems to happen to me (the other most common team is Dortmund, whom I'm managing for the first time ever). Man City are in the group stage and will most likely win the whole damn thing, I'm just hoping we can avoid any tough teams dropping out of the CL and make the final. I have some questions though. Can you detail your PI’s? Who is your AM(S) ? Have you already played some games? How do you manage your training? I’ve looked at amadou haidara and lafont how have they done for you so far? No PIs - I would have used the ones from the thread, but I changed 2/4 of the roles that had them, DLP seems fine without reduced closing down and GK distribution is a TI now. Götze is my AM, he'll retire at the club if I get my way. He doesn't play well but I just can't get AMC to play well so I don't hold it against him, and he doesn't actively make us worse like Kagawa did. 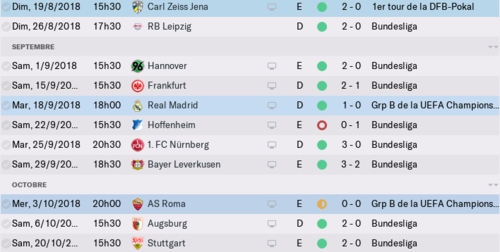 My Assistant Manager sets up general training schedules (except pre-season which I alternate between "Heavy" and either "Technical" or "Tactical" depending on his recommendation), I add GK / set piece training when there's only 1 game in a week, if I can I'll add some set piece training before big games too (I want, but usually forget, to switch to "Big Match Prep" schedule for games against Bayern / Schalke). I've recently discovered that you can schedule "Match Review" from the match prep set after a game, so the day after a game usually looks like this: Recovery - Match Review - Rest or Rest-Recovery-Match Review depending on if the game was home or away. So far P7 W7 G13 A2 including Antonio Marin making his debut as part of a reserve lineup at Dinamo Zagreb and getting MOTM. 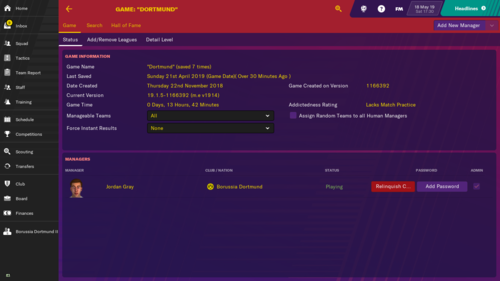 Two disclaimers though: best teams we've played have been Stuttgart and Hoffenheim who were 10th and 8th last season, and I can't get any goals out of my strikers. Haidara has been unspectacular so far - 3 yellows and 1 assist in 4 games, but the DLP-De role is pretty thankless to be honest. Lafont has been better - although we've only conceded 2 goals one of them appeared to be his fault but it isn't counted in the stats so I guess it might just have been a weakness of the graphics - but only made 12 saves from 14 shots on target faced so far. I have him taking direct and deep free kicks so I'm hoping for a goal some time soon, and his distribution is good. @Rollin93 He'll be costly, unless Fiorentina do absolutely terribly and get relegated or something - I don't think they were in Europe but they still were demanding around £40m for him (which is what I agreed to pay after a £2.5m loan, which I kinda wish I'd made a season longer just to give me more money to play with next summer). Didn't help that they made about £80m off selling Simeone and Chiesa in 2019. I felt like Bürki's Command of Area, Communication and Aerial Reach (all 13) were holding us back, particularly off corners. Lafont was 14 CoA, 13 Comm and 15 AR but with a lot of room to grow. If you're being bold though, let Luca Unbehaun get some games - he's a really good prospect and not far off the 1st team level after only 1 season. 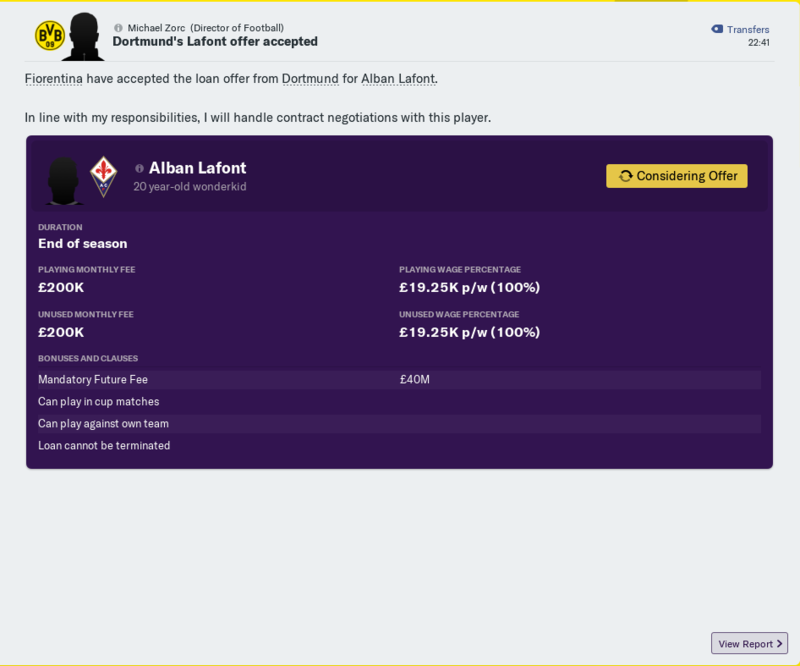 I just really wanted Lafont as I don't think I'll be doing my usual Fiorentina save this year. 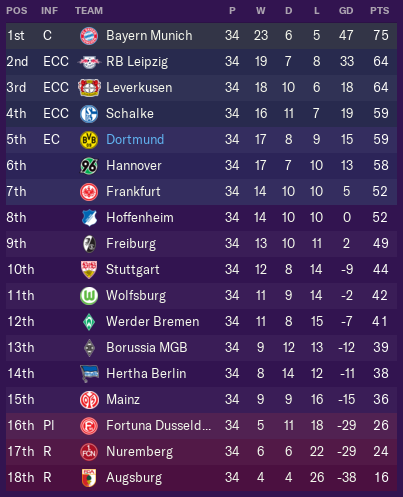 What has everyone done with Dortmund II? I was going to keep them, even though they don't get real games, as I figured it'd be somewhere to train 19-23 year olds who can't get a loan to an active league, but then I noticed I couldn't give feedback because "player hasn't trained enough recently" so I loaned out the best prospects, then either let contracts expire or sold the rest, and with staff either let their contract run out in June 2019 or mutually terminated. My u19s staff is as good as my 1st team staff (which is the best in the division, I think I have 13 members) so I figured I'll get everyone trained really good until they're 19, then they either make the 1st team or get loans. To help with these we now have a Bundesliga 2 affiliate in Holstein Kiel, although I haven't sent them anybody yet.